An eye is an organ of vision that detects light. Different kinds of light-sensitive organs are found in a variety of organisms. The simplest eyes do nothing but detect whether the surroundings are light or dark, while more complex eyes can distinguish shapes and colors. Many animals, including some mammals, birds, reptiles, and fish, have two eyes which may be placed on the same plane to be interpreted as a single three-dimensional "image" (binocular vision), as in humans; or on different planes producing two separate "images" (monocular vision), such as in rabbits and chameleons. The construction of the human eye, with its high visual acuity and color perception, aids in fulfilling the human desire to realize beauty. For birds and bees, such color vision allows them to find the showy flowers containing nectar, and for birds of prey, high visual acuity is important for finding that small mouse on the ground while they are flying high in the sky. But for humans, another dimension is added: the ability to experience joy from the rich colors in nature, the means to create beautiful works of art, the capability to see fine print and read books, and so forth. In most vertebrates and some mollusks, the eye works by allowing light to enter it and project onto a light-sensitive panel of cells known as the retina at the rear of the eye. There, the light is detected and converted into electrical signals, which are then transmitted to the brain via the optic nerve. Such eyes are typically roughly spherical, filled with a transparent gel-like substance called the vitreous humour, with a focusing lens and often an iris which regulates the intensity of the light that enters the eye. The eyes of cephalopods, fish, amphibians, and snakes usually have fixed lens shapes, and focusing vision is achieved by telescoping the lens—similar to how a camera focuses. 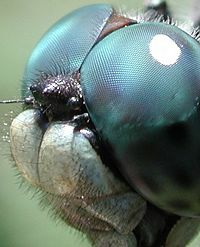 Compound eyes are found among certain arthropods and are composed of many simple facets (called ommatidia), which give a pixelated image (not multiple images, as is often believed). Each sensor has its own lens and photosensitive cell(s) and is oriented in a slightly different direction. Some eyes have up to 28,000 such sensors, which are arranged hexagonally, and which can give a full 360-degree field of vision. Compound eyes are very sensitive to motion. Some arthropods, and many Strepsiptera, have compound eyes composed of a few facets each, with a retina capable of creating an image, which does provide multiple-image vision. With each eye viewing a different angle, a fused image from all the eyes is produced in the brain, providing a very wide-angle, high-resolution image. 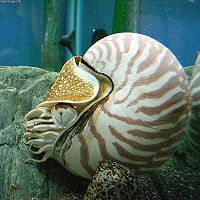 Some of the simplest eyes, called ocelli, can be found in animals like snails, who cannot actually "see" in the normal sense. They do have photosensitive cells, but no lens and no other means of projecting an image onto these cells. They can distinguish between light and dark, but no more. This enables snails to keep out of direct sunlight. Jumping spiders have simple eyes that are so large, supported by an array of other, smaller eyes, that they can get enough visual input to hunt and pounce on their prey. Some insect larvae, like caterpillars, have a different type of single eye (stemmata) that gives a rough image. The structure of the mammalian eye owes itself completely to the task of focusing light onto the retina. All of the individual components through which light travels within the eye before reaching the retina are transparent, minimizing dimming of the light. The cornea and lens help to converge light rays to focus onto the retina. This light causes chemical changes in the photosensitive cells of the retina, the products of which trigger nerve impulses which travel to the brain. Light enters the eye from an external medium, such as air or water, passes through the cornea, and into the first of two humors, the aqueous humour. Most of the light refraction occurs at the cornea, which has a fixed curvature. The first humour is a clear mass that connects the cornea with the lens of the eye, helps maintain the convex shape of the cornea (necessary to the convergence of light at the lens) and provides the corneal endothelium with nutrients (the corneal endothelium is a monolayer of specialized, flattened, mitochondria-rich cells that lines the posterior surface of the cornea). 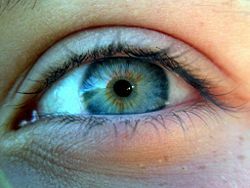 The iris, between the lens and the first humor, is a colored ring of muscle fibers. Light must first pass though the center of the iris, the pupil. 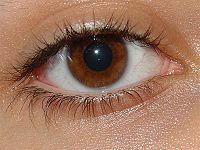 The size of the pupil is actively adjusted by the circular and radial muscles to maintain a relatively constant level of light entering the eye. Too much light being let in could damage the retina; too little light makes sight difficult. The lens, behind the iris, is a convex, springy disk which focuses light, through the second humour, onto the retina. To clearly see an object far away, the circularly arranged ciliary muscles will pull on the lens, flattening it. Without muscles pulling on it, the lens will spring back into a thicker, more convex, form. Humans gradually lose this flexibility with age, resulting in the inability to focus on nearby objects, which is known as presbyopia. There are other refraction errors arising from the shape of the cornea and lens, and from the length of the eyeball. These include myopia, hyperopia, and astigmatism. On the other side of the lens is the second humor, the vitreous humour, which is bounded on all sides: by the lens, ciliary body, suspensory ligaments and by the retina. It lets light through without refraction, helps maintain the shape of the eye and suspends the delicate lens. Three layers, or tunics, form the wall of the eyeball. The outermost is the sclera, which gives the eye most of its white color. It consists of dense connective tissue filled with the protein collagen to both protect the inner components of the eye and maintain its shape. On the inner side of the sclera is the choroid, which contains blood vessels that supply the retinal cells with necessary oxygen and remove the waste products of respiration. Within the eye, only the sclera and ciliary muscles contain blood vessels. The choroid gives the inner eye a dark color, which prevents disruptive reflections within the eye. The inner most layer of the eye is the retina, containing the photosensitive rod and cone cells, and neurons. 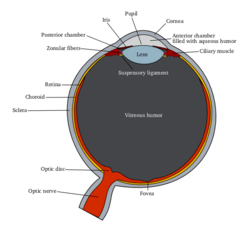 To maximize vision and light absorption, the retina is a relatively smooth (but curved) layer. It does have two points at which it is different; the fovea and optic disc. The fovea is a dip in the retina directly opposite the lens, which is densely packed with cone cells. It is largely responsible for color vision in humans, and enables high acuity, such as is necessary in reading. The optic disc, sometimes referred to as the anatomical blind spot, is a point on the retina where the optic nerve pierces the retina to connect to the nerve cells on its inside. No photosensitive cells whatsoever exist at this point, it is thus "blind." In some animals, the retina contains a reflective layer (the tapetum lucidum), which increases the amount of light each photosensitive cell perceives, allowing the animal to see better under low light conditions. The differences are useful; apart from enabling sight in both dim and light conditions, humans have given them further application. The fovea, directly behind the lens, consists of mostly densely-packed cone cells. This gives humans a highly detailed central vision, allowing reading, bird watching, or any other task which primarily requires looking at things. Its requirement for high intensity light does cause problems for astronomers, as they cannot see dim stars, or other objects, using central vision because the light from these is not enough to stimulate cone cells. Because cone cells are all that exist directly in the fovea, astronomers have to look at stars through the "corner of their eyes" (averted vision) where rods also exist, and where the light can stimulate cells, allowing the individual to observe distant stars. Rods and cones are both photosensitive, but respond differently to different frequencies of light. They both contain different pigmented photoreceptor proteins. Rod cells contain the protein rhodopsin and cone cells contain different proteins for each color-range. The process through which these proteins work is quite similar—upon being subjected to electromagnetic radiation of a particular wavelength and intensity, the protein breaks down into two constituent products. Rhodopsin, of rods, breaks down into opsin and retinal; iodopsin of cones breaks down into photopsin and retinal. The opsin in both opens ion channels on the cell membrane which leads to the generation of an action potential (an impulse which will eventually get to the visual cortex in the brain). This is the reason why cones and rods enable organisms to see in dark and light conditions—each of the photoreceptor proteins requires a different light intensity to break down into the constituent products. Further, synaptic convergence means that several rod cells are connected to a single bipolar cell, which then connects to a single ganglion cell and information is relayed to the visual cortex. On the other hand, a single cone cell is connected to a single bipolar cell. Thus, action potentials from rods share neurons, whereas those from cones are given their own. This results in the high visual acuity, or the high ability to distinguish between detail, of cone cells and not rods. If a ray of light were to reach just one rod cell this may not be enough to stimulate an action potential. Because several "converge" onto a bipolar cell, enough transmitter molecules reach the synapse of the bipolar cell to attain the threshold level to generate an action potential. Furthermore, color is distinguishable when breaking down the iodopsin of cone cells because there are three forms of this protein. One form is broken down by the particular electromagnetic wavelength that is red light, another green light, and lastly blue light. In simple terms, this allows human beings to see red, green, and blue light. If all three forms of cones are stimulated equally, then white is seen. If none are stimulated, black is seen. Most of the time however, the three forms are stimulated to different extents—resulting in different colors being seen. If, for example, the red and green cones are stimulated to the same extent, and no blue cones are stimulated, yellow is seen. For this reason red, green, and blue are called primary colors and the colors obtained by mixing two of them, secondary colors. The secondary colors can be further complimented with primary colors to see tertiary colors. Cycles per degree (CPD) measures how much an eye can differentiate one object from another in terms of degree angles. It is essentially no different from angular resolution. To measure CPD, first a series of black and white lines of equal width are drawn on a grid (similar to a bar code). Next, the observer is placed at a distance such that the sides of the grid appear one degree apart. If the grid is 1 meter away, then the grid should be about 8.7 millimeters wide. Finally, the number of lines are increased and the width of each line is decreased until the grid appears as a solid gray block. In one degree, a human would not be able to distinguish more than about 12 lines without the lines blurring together. So a human can resolve distances of about 0.93 millimeters at a distance of one meter. A horse can resolve about 17 CPD (0.66 mm at 1 m) and a rat can resolve about 1 CPD (8.7 mm at 1 m). At any given instant, the retina can resolve a contrast ratio (ratio of lightest to darkest areas) of around 100:1 (about 6 1/2 stops). As soon as the human eye moves (saccades), it re-adjusts its exposure both chemically and by adjusting the iris. Initial dark adaptation takes place in approximately four seconds of profound, uninterrupted darkness; full adaptation through adjustments in retinal chemistry (the Purkinje effect) are mostly complete in thirty minutes. Hence, over time, a contrast ratio of about 1,000,000:1 (about 20 stops) can be resolved. The process is nonlinear and multifaceted, so an interruption by light nearly starts the adaptation process over again. Full adaptation is dependent on good blood flow; thus dark adaptation may be hampered by poor circulation, and vasoconstrictors like alcohol or tobacco. In humans, the eyebrows redirect flowing substances (such as rainwater or sweat) away from the eye. Water in the eye can alter the refractive properties of the eye and blur vision. It can also wash away the tear fluid—along with it the protective lipid layer—and can alter corneal physiology, due to osmotic differences between tear fluid and freshwater. This is made apparent when swimming in freshwater pools, as the osmotic gradient draws 'pool water' into the corneal tissue, causing edema (excess water), and subsequently leaving the swimmer with "cloudy" or "misty" vision for a short period thereafter. It can be reversed by irrigating the eye with hypertonic saline. In many animals, including humans, eyelids wipe the eye and prevent dehydration. They spread tear fluid on the eyes, which contains substances that help fight bacterial infection as part of the immune system. Some aquatic animals have a second eyelid in each eye which refracts the light and helps them see clearly both above and below water. Most creatures will automatically react to a threat to its eyes (such as an object moving straight at the eye, or a bright light) by covering the eyes, and/or by turning the eyes away from the threat. Blinking the eyes is, of course, also a reflex. The visual system in the brain is too slow to process that information if the images are slipping across the retina at more than a few degrees per second. Thus, for humans to be able to see while moving, the brain must compensate for the motion of the head by turning the eyes. Another complication for vision in frontal-eyed animals is the development of a small area of the retina with a very high visual acuity. This area is called the fovea, and covers about 2 degrees of visual angle in people. To get a clear view of the world, the brain must turn the eyes so that the image of the object of regard falls on the fovea. Eye movements are thus very important for visual perception, and any failure to make them correctly can lead to serious visual disabilities. A quick demonstration of this fact can be observed by the following experiment: One can hold his or her hand up, about one foot (30 cm) in front of the nose. Keep the head still, and shake the hand from side to side, slowly at first, and then faster and faster, will allow one at first to see his or her fingers quite clearly, but as the frequency of shaking passes about one hertz, the fingers will become a blur. On the other hand, by keeping the hand still, and shaking the head (up and down or left and right), the image of the fingers remains clear no matter how fast one shakes his or her head. This demonstrates that the brain can move the eyes opposite to head motion much better than it can follow, or pursue, a hand movement. When the pursuit system fails to keep up with the moving hand, images slip on the retina and one sees a blurred hand. Even when looking intently at a single spot, the eyes drift around. This ensures that individual photosensitive cells are continually stimulated in different degrees. Without changing input, these cells would otherwise stop generating output. Microsaccades move the eye no more than a total of 0.2 degrees in adult humans. Many animals can look at something while turning their heads. The eyes are automatically rotated to remain fixed on the object, directed by input from the organs of balance near the ears. The eyes can also follow a moving object around. This is less accurate than the vestibulo-ocular reflex as it requires the brain to process incoming visual information and supply feedback. Following an object moving at constant speed is relatively easy, though the eyes will often make saccadic jerks to keep up. The smooth pursuit movement can move the eye at up to 100 degrees per second in adult humans. While still, the eye can measure relative speed with high accuracy; however, under movement relative speed is highly distorted. Take for example, when watching a plane while standing, the plane has normal visual speed. However, if an observer watches the plane while moving in the opposite direction from the plane's movement, the plane will appear as if were standing still or moving very slowly. When an observer views an object in motion moving away or towards himself, there is no eye movement occurring as in the examples above; however, the ability to discern speed and speed difference is still present, although not as severe. The lack of visual input stimuli intensity (e.g. night vs. day) plays a major role in determining speed and speed difference. For example, no human can, with reasonable accuracy, determine the speed of an approaching train in the evening as they could during the day. Similarly, while moving, the ability is further diminished unless there is another point of reference for determining speed; however the inaccuracy of speed or speed difference will always be present. When a creature with binocular vision looks at an object, the eyes must rotate around a vertical axis so that the projection of the image is in the center of the retina in both eyes. 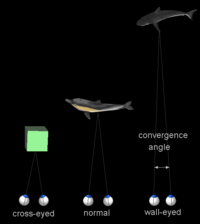 To look at an object closer by, the eyes rotate "towards each other" (convergence), while for an object farther away they rotate "away from each other" (divergence). Exaggerated convergence is called cross eyed viewing (focusing on the nose for example) When looking into the distance, or when 'staring into nothingness', the eyes neither converge nor diverge. The common origin (monophyly) of all animal eyes is now widely accepted, based on shared anatomical and genetic features of all eyes; that is, all modern eyes, varied as they are, are considered to have their origins in a proto-eye believed to have evolved some 540 million years ago. The extraordinary complexity of the vertebrate eye leads some creationists to speculate that that intermediaries are not possible, that the eye has "irreducible complexity" and must have been designed. The requirements of terrestrial vision, requiring focusing, color perception, protection from the elements, and so on, would require an organ precisely designed for that purpose. The earliest eyes, called "eyespots," are assumed today to have been simple patches of photoreceptor cells, physically similar to the receptor patches for taste and smell. Such eyespots would only sense ambient brightness: they could distinguish light and dark, but not the direction of the lightsource. This would have gradually changed as the eyespot depressed into a shallow "cup" shape, granting the ability to slightly discriminate directional brightness by using the angle at which the light hit certain cells to identify the source. The pit would have deepened over time, the opening diminished in size, and the number of photoreceptor cells increased, forming an effective pinhole camera that was capable of slightly distinguishing dim shapes. The thin overgrowth of transparent cells over the eye's aperture, originally formed to prevent damage to the eyespot, would have allowed the segregated contents of the eye chamber to specialize into a transparent humor that optimized color filtering, blocked harmful radiation, improved the eye's refractive index, and allowed functionality outside of water. The transparent protective cells eventually split into two layers, with circulatory fluid in between that allowed wider viewing angles and greater imaging resolution, and the thickness of the transparent layer gradually increased, in most species with the transparent crystalline protein. 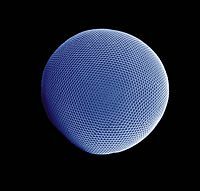 The gap between tissue layers naturally formed a bioconvex shape, an optimally ideal structure for a normal refractive index. Independently, a transparent layer and a nontransparent layer split forward from the lens: the cornea and iris. Separation of the forward layer again forms a humor, the aqueous humor. This increases refractive power and again eases circulatory problems. Formation of a nontransparent ring allows more blood vessels, more circulation, and larger eye sizes. The stye is a common irritating inflammation of the eye. There are many diseases, disorders, and age-related changes that may affect the eyes. As the eye ages, certain changes occur that can be attributed solely to the aging process. Most of these anatomic and physiologic processes follow a gradual decline. With aging, the quality of vision worsens due to reasons independent of aging eye diseases. While there are many changes of significance in the nondiseased eye, the most functionally important changes seem to be a reduction in pupil size and the loss of accommodation or focusing capability (presbyopia). The area of the pupil governs the amount of light that can reach the retina. The extent to which the pupil dilates also decreases with age. Because of the smaller pupil size, older eyes receive much less light at the retina. In comparison to younger people, it is as though older persons wear medium-density sunglasses in bright light and extremely dark glasses in dim light. Therefore, for any detailed visually guided tasks on which performance varies with illumination, older persons require extra lighting. With aging, a prominent white ring develops in the periphery of the cornea called arcus senilis. Aging causes laxity and downward shift of eyelid tissues and atrophy of the orbital fat. These changes contribute to the etiology of several eyelid disorders such as ectropion, entropion, dermatochalasis, and ptosis. The vitreous gel undergoes liquefaction (posterior vitreous detachment or PVD) and its opacities—visible as floaters—gradually increase in number. Various eye care professionals, including ophthalmologists, optometrists, and opticians, are involved in the treatment and management of ocular and vision disorders. At the conclusion of an eye examination, an eye doctor may provide the patient with an eyeglass prescription for corrective lenses. Carpenter, R. 1988. Movements of the eyes, 2nd ed., revised and enlarged edition. London, England: Pion. This page was last modified on 17 September 2008, at 23:17.